This walk: 2016-9-15. Longstone Leat, Scout Hut, Pond Water-crowfoot, 1919 PCWW boundary stone, Yellowmead Down fourfold stone circle, gateway, corn ditch, Eylesbarrow Mine blowing house, covered flue, Dartmoor ponies. Bridge at the bottom of the Jobbers Road, over the Longstone Leat, just above the Scout Hut car park - formerly Ditsworthy Bungalow was where the Scout Hut is now (in the trees). View with Sheepstor (left), Sharpitor and Leather Tor (cente "pimples") and Great Mis Tor (extreme right, in the distance). Zoomed view to Sharpitor (left: SX 560 703, elevation 410 metres or 1345 feet) and Leather Tor (right: SX 563 700, elevation 380 metres or 1246 feet). Zoomed view to Gutter Tor (SX 578 668, elevation 340 metres (1115 feet). Judging by the rounded segments of the floating leaves, Pond Water-crowfoot (Ranunculus paltatus), reference W. Keble Martin (1969 edn), The Concise British Flora in Colour. Edbury Press, Plate 2. A overview of the site, with Sheep's Tor at the far right. Click the photo to see a larger version. It is believed that there may have been a small number of stone rows emanating from the circles. The inner slabs have been thought to have been retaining kerb stones for a cairn but nothing is known for certain. Source: Jeremy Butler, 1994, Dartmoor Atlas of Antiquities Vol. 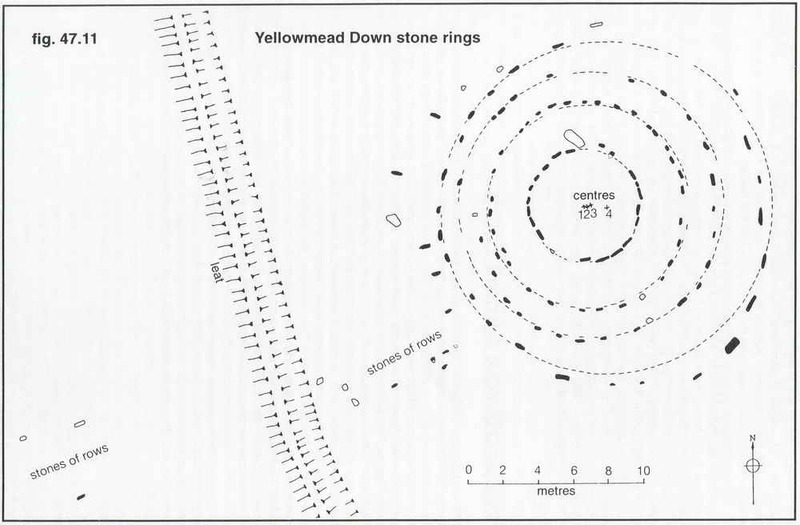 3 - The South West, 14 - Yellowmead Down circles, rows and cairns (fig. 47.11), pages 74-76. Zoomed view, as previously seen. The filled-in mine shaft, in the corner of the walls, there is an adit nearby (SX 57759 68392): I have not yet found which mine these might belong to but Roughtor Mine is not fasr away (500 metrs, at SX 57397 68675). Cist at SX 57995 68280, "Outholme cist". 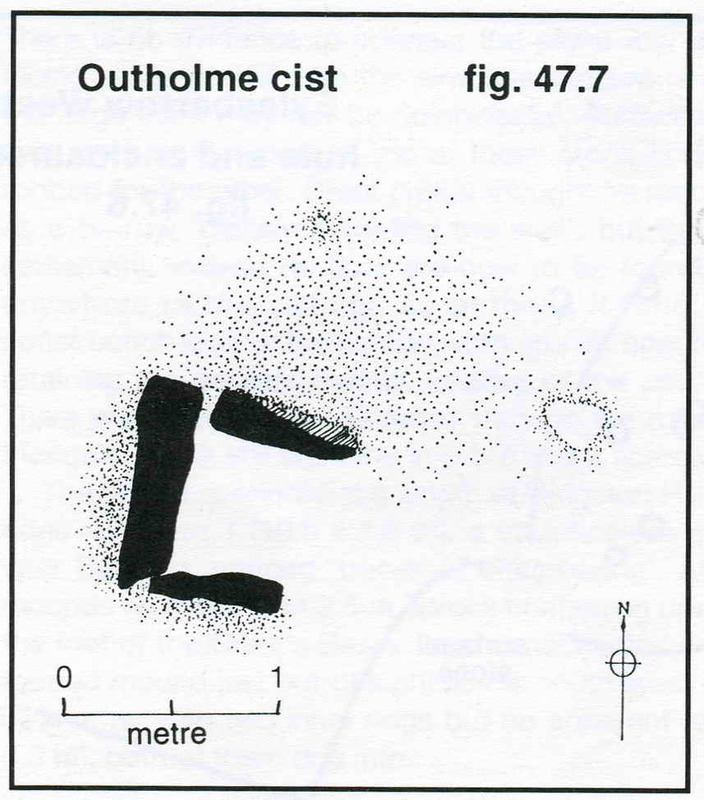 Details: J. Butler (1994), Atlas of Dartmoor Antiquities III 47.10, fig. 47.7 (page 70). Seen on 1st Oct 2009 & 4th Oct 2007. It is named after Outholme Farm which was some distance away: ruins of Outholme Farm were seen on 2nd June 2010. The cist has lost its fourth upright stone and its capstone. Source: Jeremy Butler (1994), Atlas of Dartmoor Antiquities Vol. 3 - The South West, 9, 10, 11 Eylesbarrow West huts, enclosures and cairns (figs. 47.6, 7 & 8), pages 68-70. The bottom hanger, covered by grass, was in the normal position. A wide, open view over the top of the hill from Eylesbarrow to the Scout Hut. Zoomed view to Darrtmoor ponies on the skyline. A tuft of sphagnum mosses growing among the grasses on the hill top. 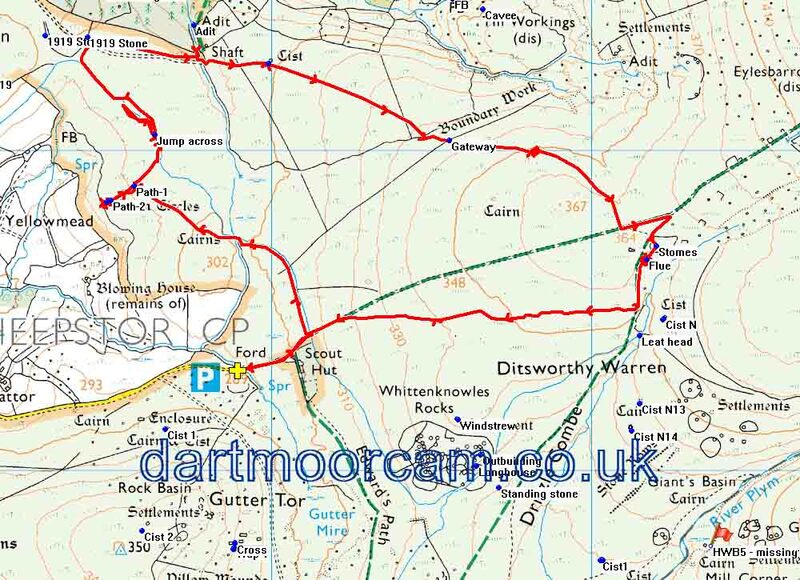 The walk is most easily approached by driving over Burrator Dam, through Sheepstor, until reaching a left turn to Nattor. Parking is at the P symbol on the map , marked more precisely by the yellow cross..